As a senior in high school, musician, and college hopeful, Jailyne received news no one wants to receive-she had Stage Four Non-Hodgkin's Lymphoma. After several rounds of chemotherapy, Jailyne's oncologist recommended a bone marrow transplant. 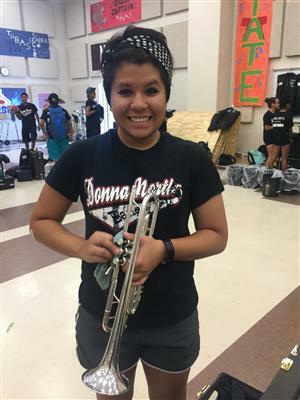 As she waited for acceptance to Texas Children's Hospital, Jailyne persisted in her academic and musical endeavors, namely the audition process for Drum Corp International, Carolina Crown. She received a call-back for the camp, but sadly had to cancel because her tumor was growing, compressing her blood vessels and chest and obstructing blood flow. Jailyne was in the hospital for two months receiving both chemotherapy and radiation, briefly released from the hospital, and then admitted to Texas Children's Hospital for an emergency bone marrow transplant. Jailyne says that having a bone marrow transplant can be described in one word-horrible. "However," she says, "being on the BMTU at TCH makes everything bearable and 100 times better." One of the ways being on the BMTU made everything better was the welcome basket that greeted Jailyne and her family upon their arrival to TCH. Jailyne's favorite items inside it were the art supplies, sketchbook, and iTunes gift card. Her mom fondly recalls the meals HGF delivered-most of all the delicious desserts. HGF also provided Jailyne and her family with housing, which Jailyne especially treasures because she gets to have her own room again. Since her long-term stay on the BMTU, Jailyne has stayed connected to His Grace Foundation in myriad ways. She participated in the BMT Lock-in, which HGF sponsored, and said she loved it because she got to "interact with other people like me." She also attended the 2017 His Grace Foundation Annual Luncheon and provided original art for the silent auction. Jailyne is a strong, generous young woman-a true privilege to serve.